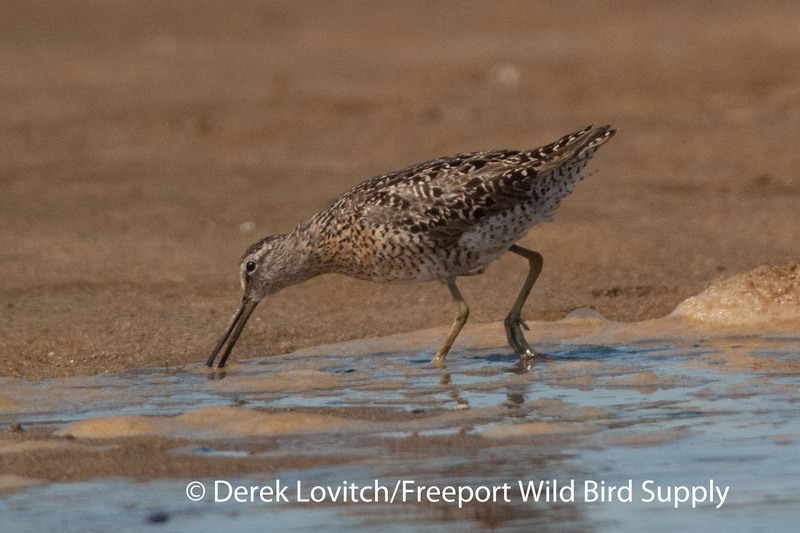 Luke Seitz and I embarked on a semi-serious “Shorebird Big Day” on Wednesday. I say “semi-serious” because we didn’t exactly try too hard to build our list…at least not after our first stop. 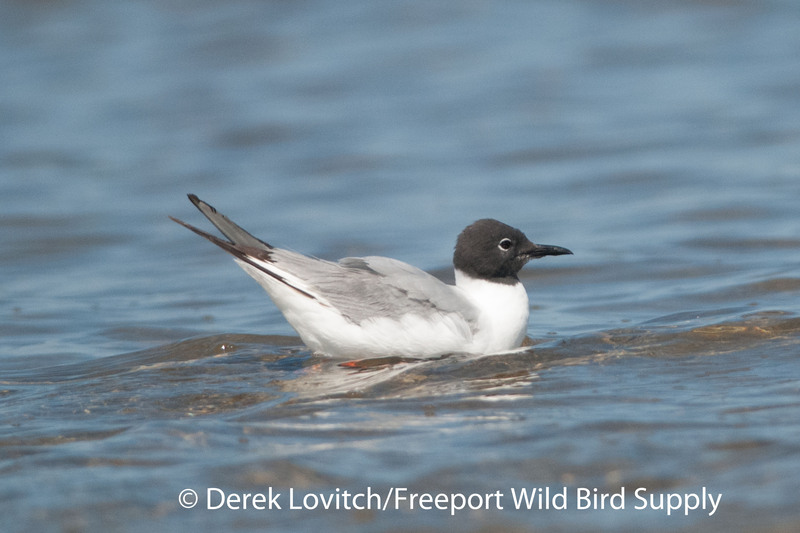 Instead, we spent more time watching shorebirds, studying, and photographing them. 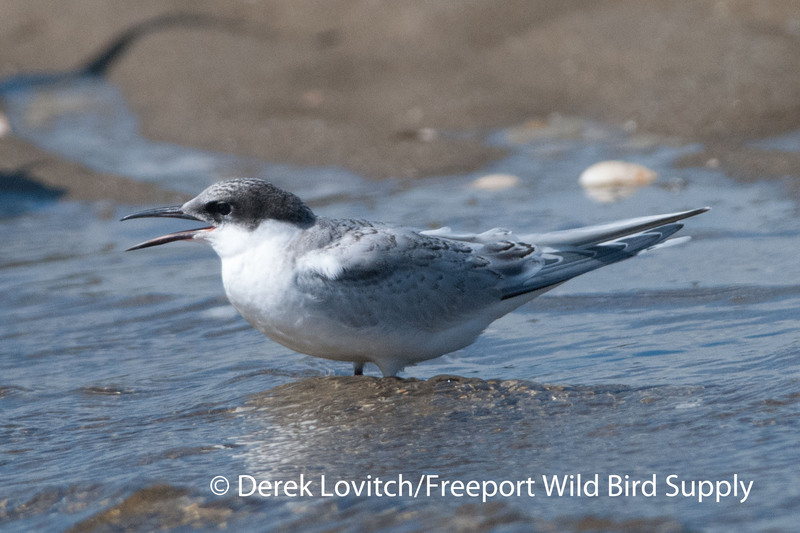 We still, however, tallied 14 species of shorebirds, but instead of heading inland to pick up Killdeer, Spotted Sandpiper, Solitary Sandpiper, and Upland Sandpiper, we just splashed in the water and studied dowitchers at Hill’s Beach. It wasn’t a bad way to spend a gorgeous summer day. We began in the morning at high tide by scouring Scarborough Marsh from the Eastern Road Trail. If we were to have a chance at 20 species of shorebirds on the day, we would need to add a rarity or two from the pannes. 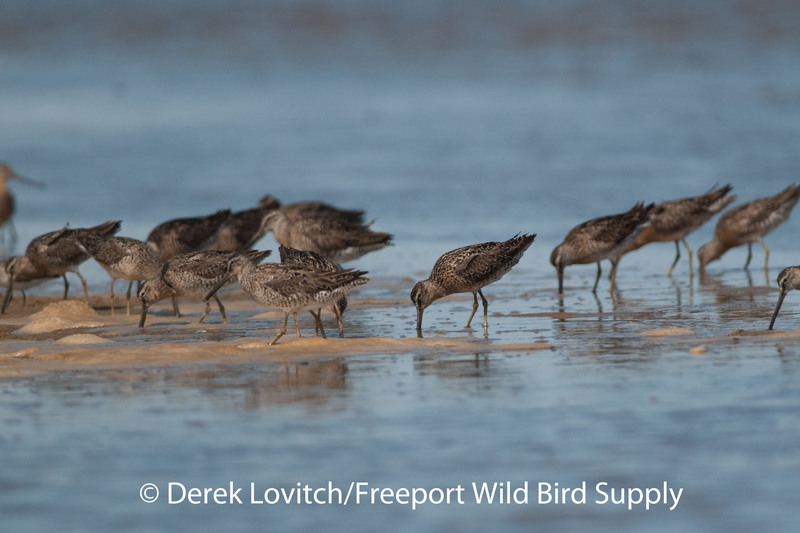 Unfortunately, high water levels from all of the recent rain minimized habitat, and shorebirds were not as plentiful as we would have preferred. We did, however, see 2 or 3 Stilt Sandpipers, a decent bird in the summer. 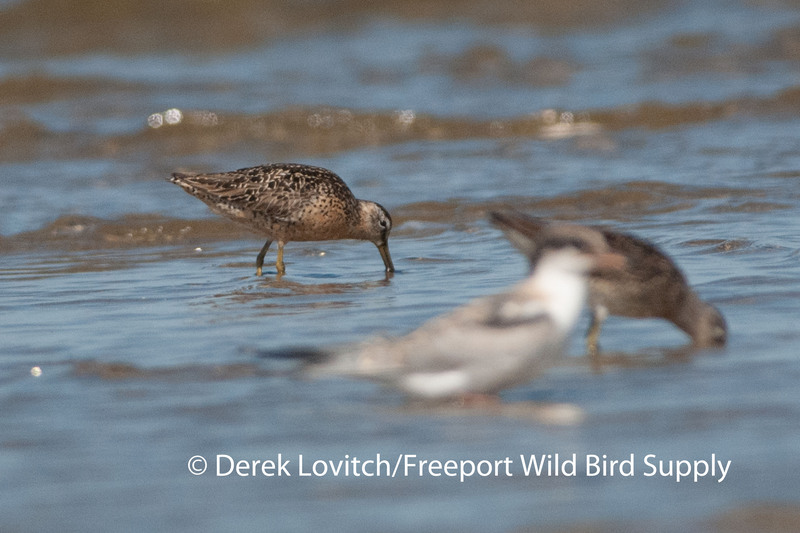 Other than Greater Yellowlegs, with about 55 individuals, numbers were relatively low: 75 Semipalmated Sandpipers, 40 Short-billed Dowitchers, 25+ Least Sandpipers, 8 Lesser Yellowlegs, 3 Black-bellied Plovers, 2 Semipalmated Plovers, and 1 Willet. 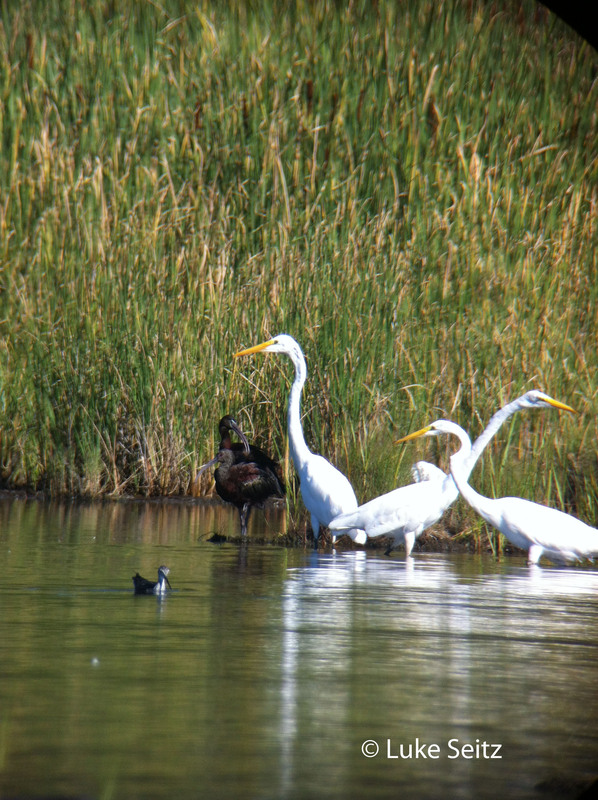 Making up for the low shorebird totals, however, were the high wading bird totals: 85 Snowy Egrets, 60 Great Egrets, 40 Glossy Ibis, 39 Little Blue Herons, and 9 Great Blue Herons. In addition to teasing out one of the continuing White-faced Ibises and spotting the continuing full Tricolored Heron, we also saw BOTH of the presumed Tricolored Heron x Snowy Egret hybrids. Yup, there are two of these beasties out there! 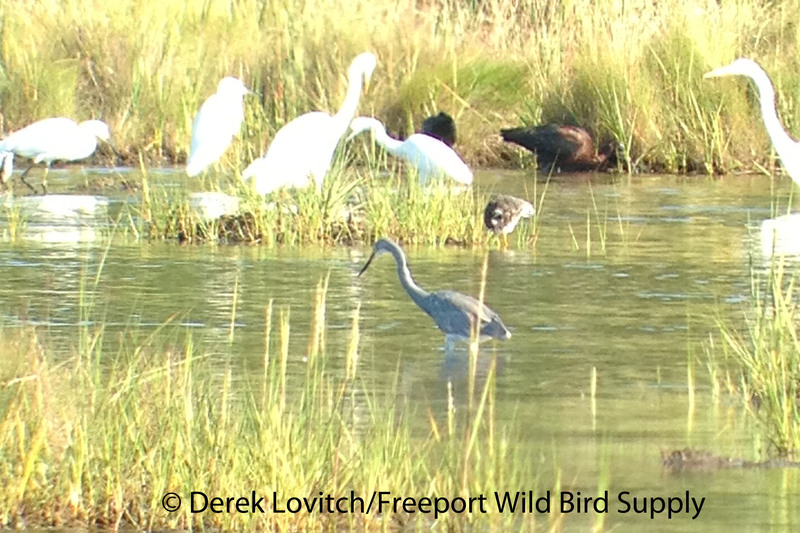 The first is the bird that has been present all summer, with a ghostly cast to an otherwise Tricolored-like pattern. Pure white is confined to the belly, the throat, and a thin line in the foreneck. Meanwhile, it was nice to see that at least one of the White-faced Ibises continue, although at this stage of molt, it was impossible to age. It was also not very close. Here’s Luke’s best shot (mine were not passable at all). 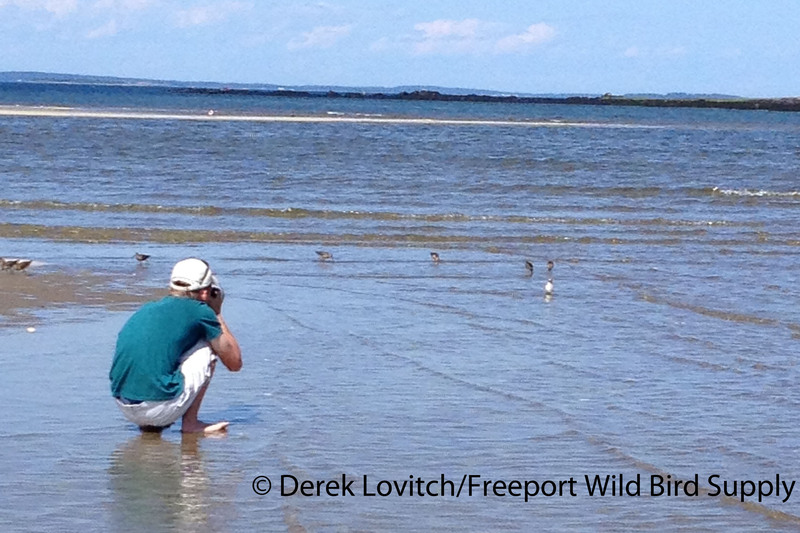 …we attempted to regain our shorebird focus over at Pine Point, as the tide was rolling out. 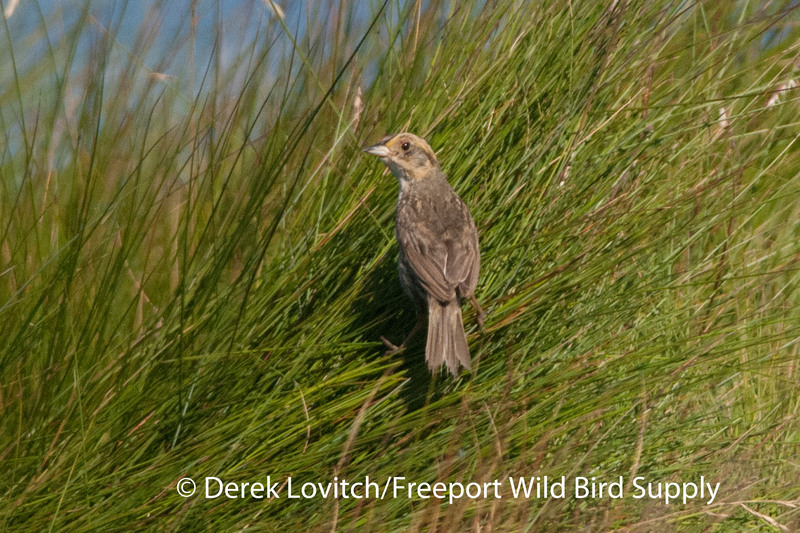 The mudflats had plenty of birds, including a few birds that would be important for a Shorebird Big Day, such as the pair – now, featuring two fledglings! – of American Oystercatchers (the only breeding pair in the state!). 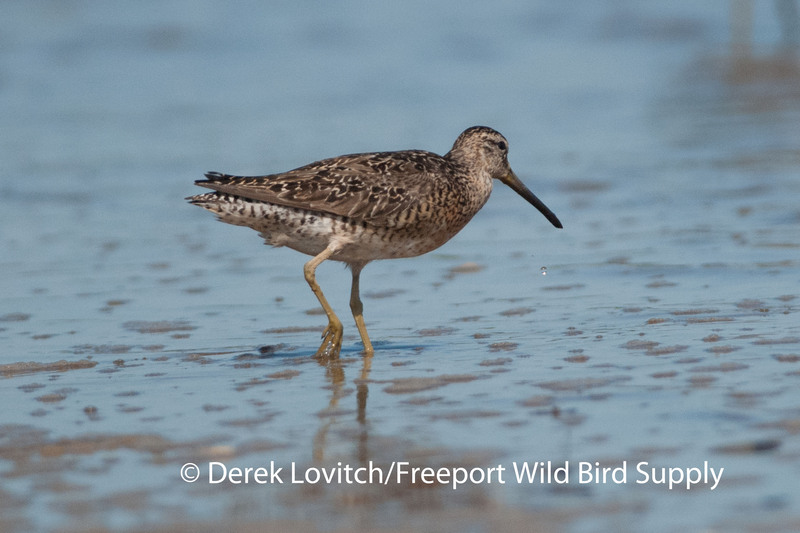 We also had four Whimbrel, along with 296 Semipalmated Sandpipers, 124 Semipalmated Plovers, 25 Willets, 25 Short-billed Dowitchers, 19 Black-bellied Plovers, 3 Ruddy Turnstones, and 2 each of Lesser and Greater Yellowlegs. But with a morning total of a mere 11 species of shorebirds, we elected for a leisurely lunch at Saco Island Deli instead of heading inland to work on our shorebird list – it is really too early in the season for a true Shorebird Big Day, but I am not sure if I have ever hit 20 in July, and since this was a day we both had a chance to get out all day together, we figured it was at least worth considering. Anyway, on the incoming tide, we visited Hill’s Beach, where once again, we elected to forego shorebird listing for shorebird “quality” time, and therefore just spent close to three hours playing in the sand. 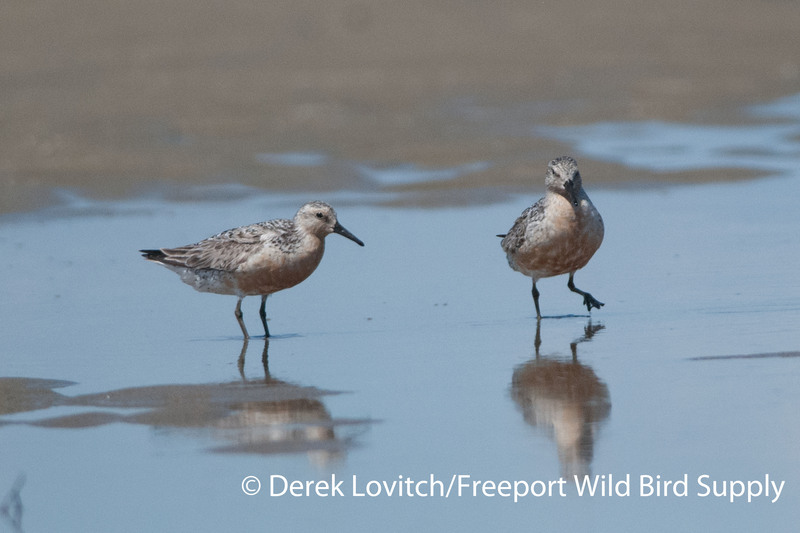 …4 Piping Plovers (a pair fledged two young here for the first time in recent memory), and 8 Sanderlings brought our count to 14 species on the day, we became distracted by photographing terns and studying dowitchers. 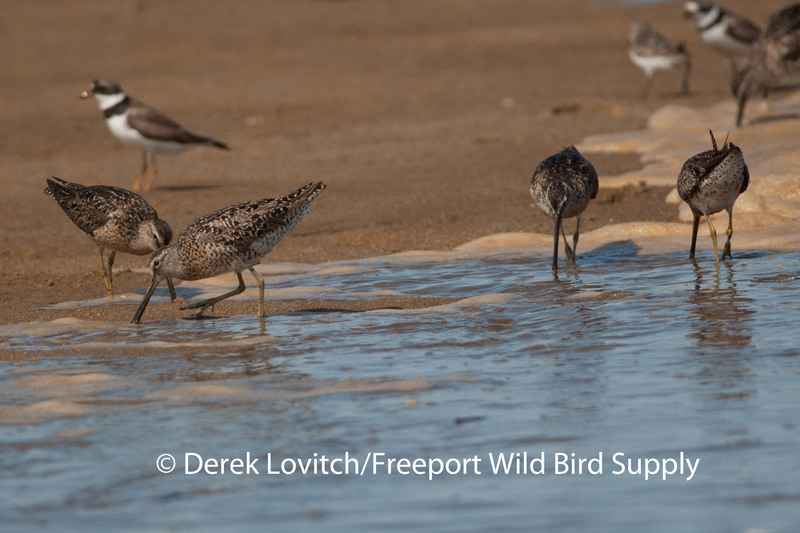 While our goodly count of 155 Semipalmated Plovers were augmented by about 65 Semipalmated Sandpipers, 8 Black-bellied Plovers, 4 Ruddy Turnstones, and 1 Least Sandpiper, it was the 120 or so Short-billed Dowitchers that kept our attention. 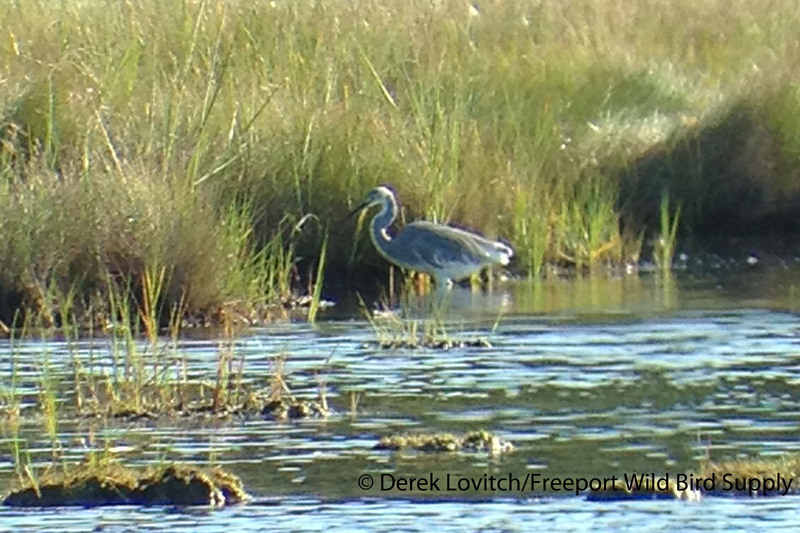 https://mebirdingfieldnotes.wordpress.com/2013/07/28/biddeford-in-shorebird-season/). We had what was possibly the same bright bird as Sunday (see above) fly-by, it was the paler birds that had us intrigued. But we were pondering how extensive of color a hendersonii “needs” to have, as most of the individuals of the expected Eastern subspecies griseus, also were showing at least a touch of peachy-orange color in the undertail, etc. Here are some typical, and typically variable, griseus for comparison. And this juvenile Roseate Tern…which was actually one of my targets to photograph today. Ok, so we really quit on the Big Day attempt by about 10:33 in the morning, but 14 species of shorebirds included Stilt Sandpiper, American Oystercatcher, and two hendersonii Short-billed Dowitcher, along with two Tricolored Heron x Snowy Egret hybrids, White-faced Ibis, Tricolored Heron, a mid-summer marsh Merlin (these birds have simply got to be breeding in coastal Cumberland County! 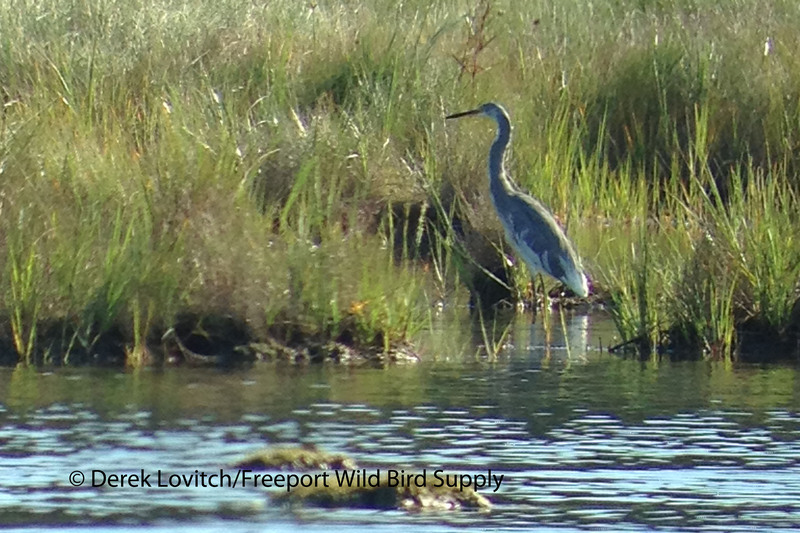 ), it was hardly a bad day of birding. In fact, it was actually a spectacular day! 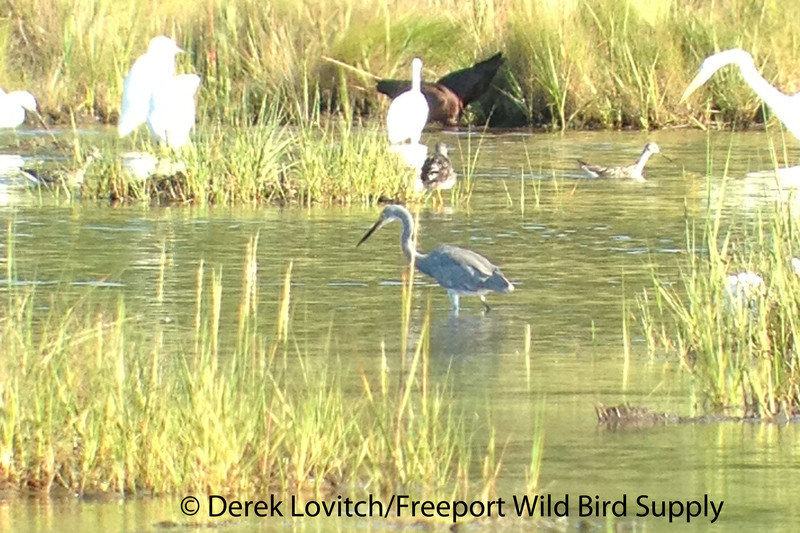 This entry was posted in Birding in Maine and tagged "Hendersonii" Short-billed Dowitcher, Biddeford, Birding, Hill's Beach, Maine, Pine Point, Scarborough Marsh, shorebirds, Short-billed Dowitcher, terns, Tricolored Heron, Tricolored Heron x Snowy Egret hybrid, wading birds, White-faced Ibis on August 1, 2013 by Derek.